Conas meabhrúcháin a thabhairt i gcónaí chun tosaigh ar iarratais in Outlook? De réir réamhshocraithe, osclaíonn fuinneog meabhracháin Outlook suas taobh thiar de na fuinneoga oscailte eile. Dá bhrí sin, féadfaidh tú meabhrúcháin tábhachtacha a chailliúint i Outlook le linn do chuid ama gnóthach. Chun meabhrúcháin in easnamh a sheachaint in Outlook, is é an bealach is fearr a thabhairt i gcónaí na meabhrúcháin os comhair gach fuinneog oscailte. Cabhróidh an modh san Airteagal seo leat é a bhaint amach. Cuir isteach an cód VBA seo a leanas chun meabhrúcháin a thabhairt chun tosaigh ar iarratais in Outlook. 1. 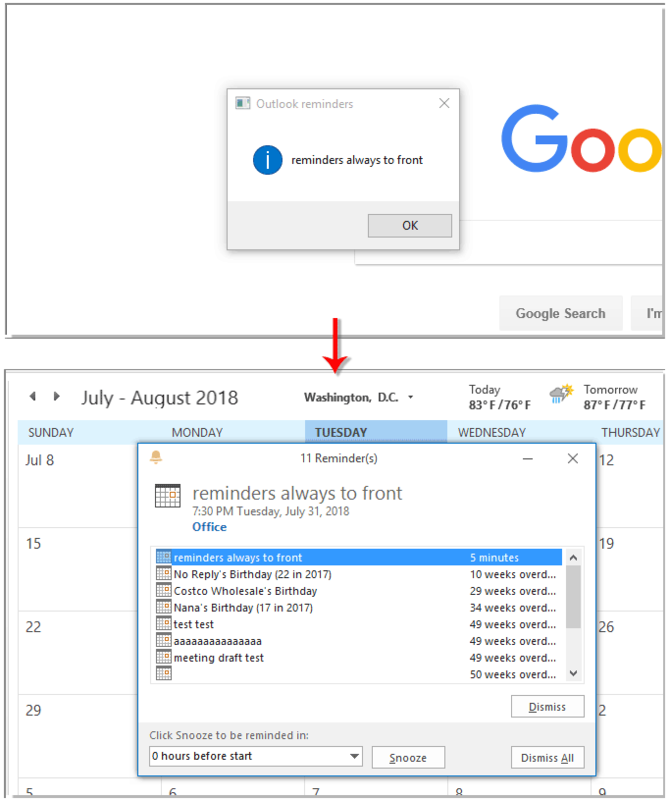 In Outlook, brúigh an Eile + F11 eochracha a oscailt Microsoft Visual Basic d'Iarratais fhuinneog. 2. Sa Microsoft Visual Basic d'Iarratais fuinneog, cliceáil dúbailte ar an ThisOutlookSession sa phána chlé chun an fhuinneog cód a oscailt. Cóipeáil an cód thíos isteach san fhuinneog ansin. MsgBox xAppointment.Subject, 4096 + vbInformation + vbOKOnly, "Outlook reminders"
3. Brúigh an Eile + Q eochracha a dhúnadh Microsoft Visual Basic d'Iarratais fhuinneog.